These rains, so far at least, have been fine for the farm. With the intensity of storm systems like this we can just know we’ve done everything we can to grow great crops for a great harvest, and try to get a good night’s sleep, and enjoy the magnificence of the thunder, lightning and rain. It’s a little heavier downpours than we like, but the amounts aren’t absurd so the plants and soil have been able to absorb much of it. The new drainage improvements are working well, and will work even better once the grasses and flowers get established where the bulldozer has been. With all the moisture, when the sun comes out the crops grow like crazy! So thankfufully in this rainy spell we’ve been getting sunny spells interspersed. Hopefully the four-letter “h” word stays away from everybody trying to grow food; it’s a fascinating act of nature but that’s entertainment not worth the cost. 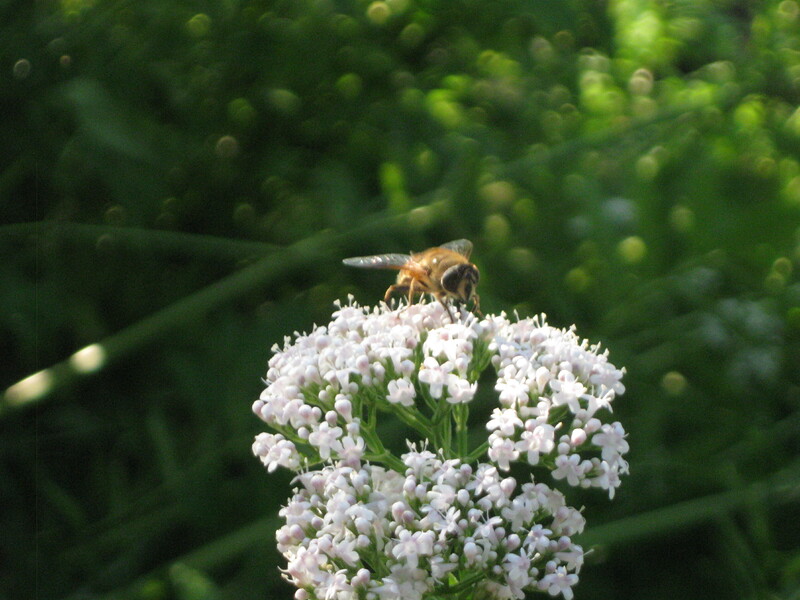 The honeybees and native bees are active all over, from the asparagus flowers to the summer squash, cucumbers, and valerian. It’s fun to hear their buzzing and the smell of honey from the hives is intoxicating. There are lots of hoverflies, parasitic wasps and flies large and small, ladybugs, spiders and other predators all in their places chewing on many pest insects, even though they’re relatively sparse so far. The ladybugs, spiders and lacewings have been working on the aphids in the lettuce. In the potatoes, we haven’t yet seen a potato beetle but the spiders and ladybugs are there waiting, it seems. Maybe you saw the lovely field of green grain to the east of the driveway, down by the road? It was a gorgeous six foot tall field of worm food! Now it’s plowed under and the insect and microbial life eating it underground will feed our fall plantings of greens, lettuce and spinach. We’ll start planting in there in late July, and put the last lettuce seeds in the ground in early September. It was a bittersweet goodbye tilling it under, since it was so beautiful above ground, but this is what we do. We feed the soil, and it feeds us, so down it went. While discing it at sunset, a lacewing bit Ben’s arm, vigorously, especially for a normally people-friendly, dainty-looking insect. It was a strong reminder of the many creatures living and working on this Earth. With rain coming and unable to justify leaving the rye standing any longer, we hoped the good working bugs would find a new home nearby, in the strawberries, flowers, grassy areas, or in the other cover crop nearby. Eventually that one will get turned under too, to feed some fall kale, but hopefully they’ll be able to find a new home then too, even if they have to bite us as they move out. This week, depending on the amount of sunshine we see, it looks like we’ll be picking the first few broccoli, kale and baby leeks. The broccoli is probably the most surprising and exciting part, we’ll see what it does. Broccoli and kale might be slow to start, but once they get rolling we should have them awhile–there may be some gaps but hopefully we’ll have both until winter though sometimes the bugs steal some in the middle of summer. 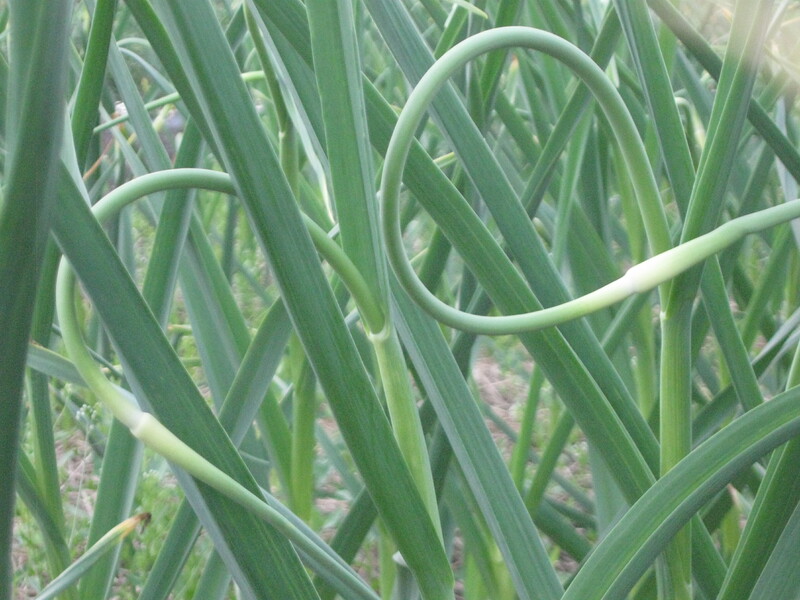 Baby leeks are a new thing for us, we’ve always done fall leeks but thought we’d try this out. Like the pea shoots, a different flavor in the mix early in the season is welcome. We expect to have them for a month or so. Summer squash is on its way, maybe tiny trickles next week, we’ll see. Carrots and beets and swiss chard are sizing up, and should be pickable in the next couple weeks. It seems like it just started, but spinach might be done until fall. Spring spinach is always short-lived, but we were surprised since it looked so healthy and happy but started bolting even before the sun came out last week. We might be able to scrounge some this week, if not we’ll have to wait for September, when we plan to start having loads of it again. For all these things, the more sun the better, but temperatures over 90 can do more harm than good. They’ve certainly got plenty of rain to work with, so we could see lots of awesome healthy growth this month. Always an adventure! Pea shoots will continue to be good for this week. We hope you’re enjoying them! A little taste of what’s to come. They’re a new crop for us, let us know what you think. The snap peas are now four feet high and flowering, so we may start picking peas in a week or so. Strawberries will start trickling this week— there’s a few ripe ones, and most are still sizing up so we should be picking lots next week. The peas are south and west of the driveway, and we have two plantings of strawberries, one east of the driveway, and one by the peas. When both crops are in season at the same time, and you all hopefully spending longer chunks of time picking and enjoying the farm, it will be interesting to see how the wider driveway and expanded hours help with any sense of overcrowding. 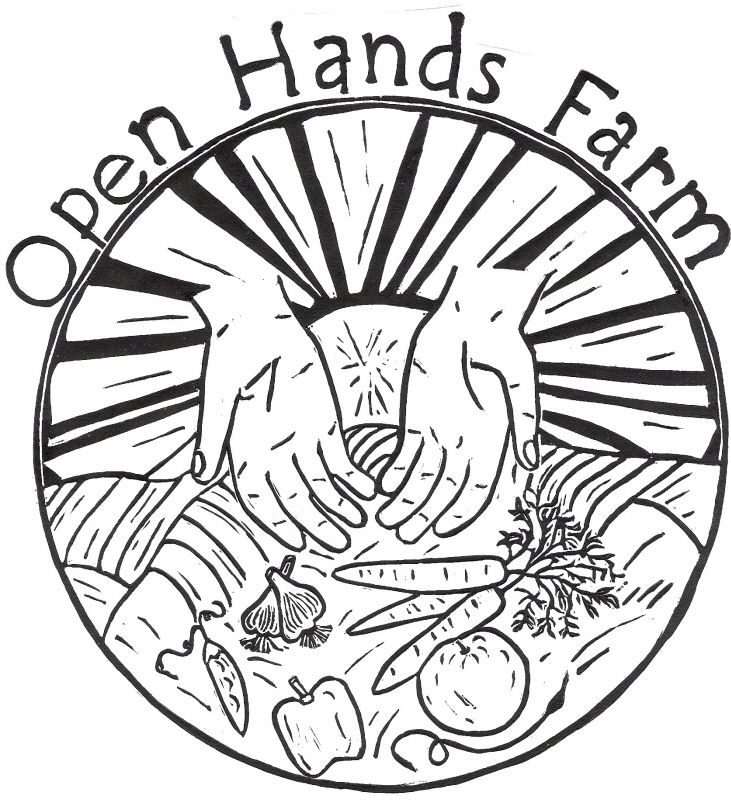 Our hope is for community enjoyment with enough wiggle room to enjoy the open space of the farm. Cilantro is in and we keep planting so we should have a continuous abundance until, well, winter. Cut with scissors and leave about 3″ of plant with some baby leaves, for best re-growth. Please always check the U-pick board when you’re here to see what’s available and picking amounts. It can change with the weather, forecast, insects, etc. We try to grow enough of the U-pick crops to not have limits, but as the crops first ripen we often need to limit amounts per share so everyone gets some. This is especially true with the sweeter juicier ones that we all love so much–peas, berries, cherry tomatoes. These ones are also the most susceptible to changes in weather — excess rain and clouds can make the berries and tomatoes split, taste watery, or go moldy, or all three. For now, though, since most of them are not ripe yet this heavy rain should be fine for the strawberries, just plumping them up, with the peas. Remember your reusable bags and also to sign in when you pick up your share. We have one size of reusable bag–chico bags–in the shareroom now, soon we hope to have an option that’s the same size as the clear produce bags. We’ve had the cloth ones in the past but too many people had the problem of them shrinking in the dryer–we swear that wasn’t our intent!!!!! Keep an eye out for the new ones. Remember to pick up your CSA Handbook! If you need a first copy or a replacement, let us know. We have a limited supply now since we’ve had computer challenges, but we hope to have more printed soon. It’s a great resource to help you make the most out of eating with the farm. You’ve all done a great job remembering to sign in, thank you, it’s very helpful to us! If you split a share, please sign in on the same line as your share partner. And you can leave notes for each other about who took or should take which veggie, etc, on the note paper next to the sign-in sheet. Pullin’ Weeds —Tuesday and Thursdays are the best days to join in, some or all of us here should almost always be weeding then. Other days might work too. It’s best if you call or email us ahead of time so we can better coordinate helping hands, but “walk-ins” are welcome too! Note that some days we are pulling thistle (everybody’s favorite) so most of us are happiest if we come prepared with lightweight long sleeve shirt and pants. And water to drink! Gloves etc — As you’ve noticed we’ve been trying out rubber gloves in the barn for picking out your greens and other crops. We’ve gotten lots of good feedback from many of you, and have decided that it might work best if we have a few options to help you select your produce while maximizing the food’s safety and cleanliness. This week we’ll have the handwashing station closer to the door so it’s easier to remember, and the gloves. Soon we’ll have some tongs to try out too, and we’ll ask that you choose from those three options, to avoid bare hands in the greens baskets without using one of these methods. We hope this helps keep everyone’s food as healthy as possible., and thank you for helping! Heat the oil in a large saucepan over medium heat, then add the scapes and sauté for 2 minutes. Add the potatoes and stock, cover, and simmer for about 20 minutes, or until the potatoes are cooked through and beginning to break down. Remove from the heat, add the spinach, and puree using a hand blender. (If you must use a conventional blender, be careful; the hot liquid can burst out the top and make a huge, potentially painful mess. Try leaving the lid slightly ajar to allow steam to escape. Cover the top with a kitchen towel and blend in batches at low speed.) Season with salt, and a few grinds of pepper. Whisk in the cream for a silkier texture. If the soup tastes flat, add salt a few big pinches at a time until the flavors really pop. Serve garnished with the chive blossoms.